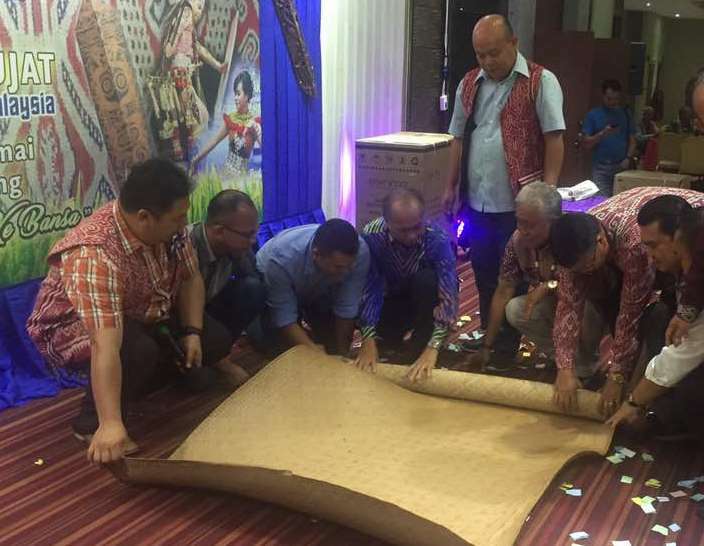 Dato Masir Kujat (squatting, 4th left) and other guests rolling a mat to mark the ‘ngiling bidai’ ceremony. SRI AMAN: The Dayak community needs to forget their differences immediately after the Gawai celebration, said Deputy Home Minister, Dato Masir Kujat when he officiated at a ‘ngiling bidai’(Gawai closing) organised by Sri Aman police here on Friday night. “The Dayak community must continue to unite and to forget about the past,” said Masir who is also Sri Aman MP. He also appealed to the people of Sri Aman to help in the fight against drug abuse which is causing concern especially among the youths. Among those present were Walikota of Sri Aman, Richard Tawan Sedu, Sri Aman JASA Officer, Geoffry Baja Ricky Maba, representative of Sri Aman Resident, Crispin Francism and ASP Aleng Lamat. Also held during the event were a cutting of cake, tuak drinking contest, Indai Kumang Contest, presentation of study incentives and lucky draws. Masir officates at ‘ngiling bidai’ 0 out of 5 based on 0 ratings. 0 user reviews.